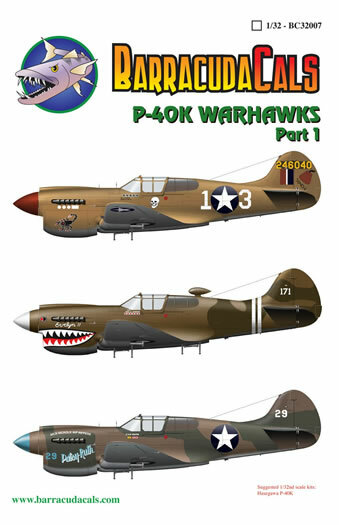 Barracuda Studios announces the release of a new decal sheet for the P-40K. This is available right now, in 1/32 and 1/48 scales. 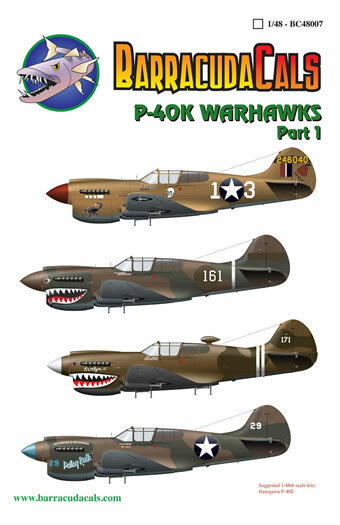 The large scale release is the first and only aftermarket sheet ever made (so far) for the beautiful Hasegawa 1/32nd P-40K. Three attrractive and varied schemes are featured. White 1 3 is an interesting aircraft. While it has been done in decal form before in 1/48th scale, it has never been done even close to correctly. The Scorpion on the nose was not correct, and the markings on the rudder were missing altogether.